“Sunken Treasure” by Eve Alfillé. Photo credit: Matt Arden. For such a tranquil stone, it is amazing how it can still hold such power to excite powerful emotion! This gorgeous, green-hued variety of beryl caused quite a stir, for instance, when the notorious conquistador Cortez brought home a supply of emeralds from the ‘New World’ where they existed in abundance. 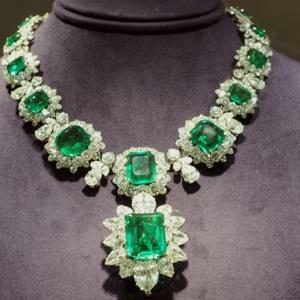 The most magnificent emerald of the hoard was engraved with the words “among those born of women, a greater has not arisen,” which he intended to give to his bride as a fitting wedding present. This fortune, however, was perhaps not so fortuitous; historians maintain that the Spanish Queen was so disappointed that she was not the recipient of these gems that she became his enemy for life! The historian Brantôme even claimed that it was a sacrilege to engrave upon the face of any material so beautiful, and Cortez’ perceived comeuppance for this atrocity included the loss of a pearl of unparalleled magnificence, so lovely that he composed “A Beautiful and Incomparable Pearl” in its honor, the loss of this entire horde in a shipwreck, and even the death of King Charles IX of France. “Treasures of Ur” by Eve Alfillé. Photo credit: Matt Arden. For those of you who are comfortable keeping more of a long-distance friendship with the deceased, but just want to look like Angelina Jolie strutting down the red carpet in magnificent emeralds (her favorite ), never fear! Emeralds can come from just about anyplace in the world, with the ironic exception of Ireland. A famous Egyptian source known as “Cleopatra’s Mines,” though only slim pickings of emeralds remain there today, were known to have once produced a generous abundance of emeralds that lasted over three thousand years! 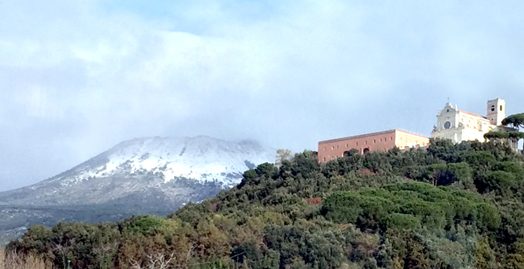 These mines were likely responsible for the bulk of Rome’s abundance of emeralds during the height of its opulent reign. But, dear reader, rather than turn green with envy at all of these famous gems of the past…why not simply carry home a precious little (or big) emerald of your own? Still want to know more about emeralds? We hear you! 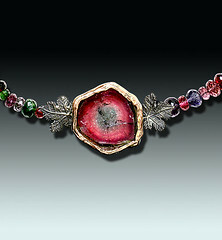 Click over to Eve’s previous post on the May birthstone, Romancing the Stone, to get your gemstone fix! 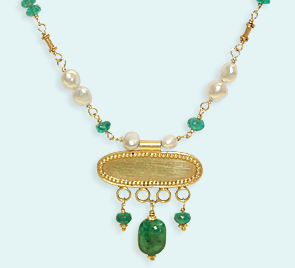 Some of you may become green with envy as we introduce the birthstone for May: Emerald. 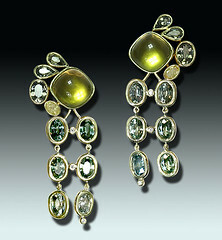 For a closer look at both finished Emerald, stop by the gallery and ask to see some Emeralds. Emerald is a variety of Beryl, which gets its green color from the presence of trace amounts of the metal elements chromium & sometimes vanadium. As these two elements do not play particularly well together, they can cause minute stresses, creating the typical inclusions seen in most emeralds. The French give these a pretty name: Jardin (garden). Most emerald are mined in Colombia and Brazil, although a newer source of fine, relatively clear Emerald has been discovered in Zambia, Africa. Emerald in various concentrations have been found in places all over the world including the U.S., but ironically have not been located in Ireland which fancies itself “the Emerald Isle,” for its lush green countryside. More than 2,000 years ago, Egyptian queen Cleopatra had a passion for emeralds and wore them in her jewelry, and they have been in demand ever since. Speaking of Cleopatra, one famous actress who portrayed Cleopatra, Elizabeth Taylor, is quoted as saying, “Oh my god!! 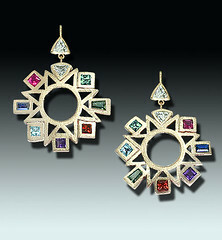 I’ve got to have the emeralds!” And so she did… check these out! Not understated, but very WOW!! In 330 BC Egyptians began mining emeralds, and buried their mummies with emeralds around their necks to symbolize eternal youth. During the sixteenth century Spanish Explorers discovered emeralds in South America and introduced them throughout Europe. It was said the Spanish conquistadors discovered and overtook the emerald mines in present-day Colombia. But it took them fifty years to finally overpower the Muzo Indians who occupied the area and refused to reveal the sources of their mines to the greedy Spanish, even under torture! Legends claimed that emeralds had power to cure diseases such as cholera and malaria and to make the wearer quick-witted and intelligent. 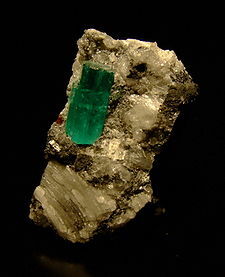 Emerald mined in its natural state, originating from a mine in Muzo Columbia. About emeralds, Roman historian Pliny said, “No stone has a color that is more delightful to the eye, for, whereas the sight fixes itself with avidity upon the green grass and the foliage of the trees, we have all the more pleasure in looking upon the emerald, there being no gem in existence more intense than this.” Following Pliny’s advice, the Roman Emperor, Nero, watched gladiator fights through emerald-encrusted sunglasses.